Pork, known as “the other white meat” is regularly consumed by many across the country. Fresh pork offers many health benefits as it contains only around 5 grams of fat and 190 calories per 3.5 ounce serving. Lean pork has as much as 30 grams of protein as well as B vitamins, phosphorus, magnesium, iron and zinc. However, spoiled pork can be dangerous to consume so it is important to know when pork has gone bad. Check the packaging before you buy or cook pork. If there is a “use by” date printed on the package, make sure you freeze or cook the pork before this date passes. If there is no date listed or only a “sell by” date marked, try to cook or freeze the product within five days of your purchase. You should not eat any pork that has an expired date on the package unless it was frozen first. Pork that is fresh should not have a noticeable odor. If you notice a strange or sour odor the pork you are working with is not fresh and should be thrown away. There is an exception for pork that was vacuum packed which will have an odor from the packing process. This should fade after you rinse the meat under cold water. Your pork should be moist and firm, while pork that has spoiled will be sticky, dry or hard. If you are at the grocery store, squeeze or press on the meat to ensure that the piece you would like to buy is fresh. Fresh pork is white or pink, and any other coloring such as gray, green or brown suggests that the pork has spoiled. This can be a sign of freezer burn, bacteria or yeast contamination, breakdown of the proteins or mold. The marbling of fat in the pork should always be white. If you notice any graying or yellowing in the fat the meat has spoiled. If you notice any hints of discoloration on your pork, throw it away. Storing your meat properly can help prevent your pork from spoiling prematurely. Keep your pork in a freezer bag when you place it in the refrigerator or freezer. Take it out of the plastic wrapping from the store before storing. Remove excess air from your storage container before you store your pork to cut down on the risk of oxidation and freezer burn. The minimum refrigerator temperature pork can be kept at is 40 degrees Fahrenheit. 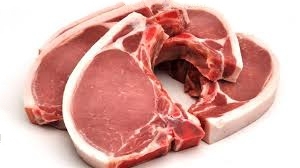 If your pork has been refrigerated you should consume it within four days of purchase to ensure it will be fresh. Pork that has been frozen should be consumed by six months after it was placed into the freezer.